The story in one sentence: Two young wanton police officers have to learn the hard way that they are not invincible while interfering in the activities of a Mexican cartel. Storyline: Police officers Brian Taylor (Jake Gyllenhall) and Mike Zavala (Michael Peña) are not only partner but best friends who are fighting crime in the streets of L.A. together. While Mike – who envies Brian for his lose life style – has married his high school sweetheart and is expecting a baby, Brian is tired of endless encounters of one night stands and ready to settle down with a girl who “gets him”. Brian is recording most of their actions for a project, so besides a hand-held camera he has several mini cams attached to the car, their office, and even to himself. When the two notice illegal activities in a Hispanic neighborhood, they are determined to bust whoever is behind it and start a ruthless war. 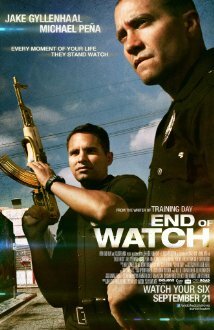 My Review: I am usually not a fan of low-budget movies that are shot with a hand camera, so I had very low expectations for End of Watch. After about 15 minutes I was hooked and felt connected to the cocky, yet very likable protagonists. It felt like I was in the movie with them, at times I even forgot I was watching a movie. Their conversations seemed so authentic that my guess is the director David Ayer said, “Just have a conversation, we’ll see if we can work with that!”. They talked about the most common things but it was still interesting and made me laugh at times. I also liked America Ferrera’s (a.k.a. Ugly Betty) performance a lot. Even though the movie seemed like a student project it was obvious that it was made by someone who has an eye for photography and placement. Some of the shots were clearly defined and nicely but naturally staged. I really enjoyed this documentary style movie and I think it seemed more authentic and less staged than many reality shows currently out on TV. Pingback: Absence (2013) – Another Paranormal Thriller Made With a Hand Held Camera | Simon Says... WATCH THIS! Pingback: Movie Review – Prank (2013) – Enough with the handheld camera already! | Simon Says... WATCH THIS!